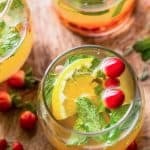 Lime Mint Kombucha Cocktail an easy low calorie cocktail recipe made with vodka, fresh orange juice, kombucha, mint and white wine. Light, refreshing and delicious! Add fresh mint to a large pitcher along with orange juice. Muddle using a wooden spoon or cocktail muddler. Next, add lime mint kombucha, vodka, honey and white wine. Stir to mix everything together. Serve over ice. Garnish with pomegranate arils or fresh cranberries.